SP's Land Forces (SP's): In the reconstitution of responsibilities within the Army Headquarters, DCOAS (P&S) has been assigned far greater responsibilities. All the DGs of line directorates now report to him. Hence the role assigned to the DCOAS (P&S) has been enhanced considerably. How is the system functioning? What are your views in this regard? Deputy Chief of Army Staff (P&S) DCOAS (P&S): The reconstitution of responsibilities in the Army Headquarters (HQ) has made the functioning smoother for all line duties as well as for the DCOAS (P&S). Having said that, I would say that there has not been any paradigm change of responsibilities or the hierarchy. As the DCOAS (P&S), I am responsible for the modernisation of the Army and managing the capital budget. The system facilitates consolidating requirements which are common to all the line directorates and projecting consolidated cases for modernising the Army. This leads to economy of scales and financial prudence. In addition, it obviates the duplicity of effort and reduces the gestation time for induction of new equipment. Arms and equipment like small arms, bullet proof jackets, night sights, vehicles and host of other equipment is being procured across the board. Various line directorates are nominated as the lead directorate for a particular type of equipment. This streamlines the procurement process, as coordination between the line directorates becomes much simpler, being directly under the DCOAS (P&S). SP's: Field Artillery's equipment profile has been adversely affected by non-procurement of 155mm guns and howitzers, both self-propelled (SP) and towed variety, resulting in fire power deficiency in the Indian Army. This has been reported extensively in the media. Can you update us on the status of procurement of 155mm (Towed) guns to replace older generation equipment; acquisition of the 155mm/ 39 calibre ultra-light weight howitzers (ULH) which is being procured through the foreign military sales (FMS) route; procurement of 155mm self-propelled (SP) guns to fill existing voids. DCOAS (P&S): The Army is looking at equipping Indian Artillery with state-of-the-art fire power platforms. Towards this end, several initiatives to procure various types of 155mm guns for varied operational roles are at various stages of fructification. A three pronged approach is being adopted, wherein the immediate requirement would be procured ex import; the medium-term requirements would be manufactured after absorbing technology transfers; while the long-term requirements would be met by indigenous developments. 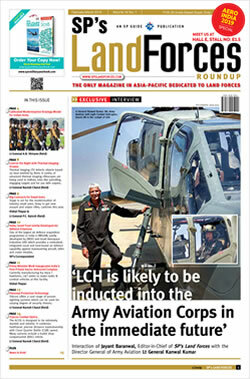 SP's: Army Air Defence is in dire straits. No new equipment has been inducted in the last three decades or so. All equipment currently held is outdated and in many cases obsolescent. What are the measures being taken to rectify this situation? DCOAS (P&S): A carefully formulated capability development plan of Army Air Defence has been put in place which is in line with the current Army Air Defence philosophy. The philosophy envisages a significant shift from point defence air defence system to theaterised employment of air defence resources. The concept of theatre air defence involves dynamic and centralised employment of air defence resources to provide layered and tiered area air defence cover against air and missile threats. Necessary impetus is being given to progress numerous procurement cases, which are at varying stages of the procurement process. Issues of limited vendor base for technologically complex air defence systems, along with security restrictions on transfer of technology and limited indigenous capability for development of complex air defence systems had led to new equipment being inducted. These have now been addressed through research and development (R&D), transfer of technology, indigenisation and involvement of private industry. SP's: L-70 guns have been with us for more than 40 years. The radars of this system have been changed many times but the gun system has not been changed. They constitute almost 50 per cent of the strength of air defence systems in the Army. What is being done in this regard? Upgradation of select number of existing guns with an improved sighting system, power laying and onboard power supply. Procurement of a successor gun system in a phased manner to meet the balance requirement. SP's: What is the status of Arjun Mk II and what is the plan for further induction of Arjun tanks? DCOAS (P&S): MBT Arjun has been in operational service with the Indian Army since 2007. For an emerging world power, we have to be self-reliant, with a strong indigenous defence industry. Therefore, MBT Arjun is a step in the right direction. We are now focusing on introducing an improved MBT Arjun Mk II with upgrades, to make it a truly world class tank. The Army has clearly articulated its long-term perspective plan for induction of tanks based on its armour philosophy. MBT Arjun and its upgraded version have a defined role to play in this. SP's: What is the status of future main battle tank (FMBT)? DCOAS (P&S): The FMBT will be an indigenously designed and developed tank. All stakeholders would be brought onboard as the project progresses. It would be based on the guidelines of the DPP and indigenous industry would be involved to the extent possible. The developmental project will be monitored in all stages of development, from the principal staff qualitative requirements (PSQR) stage to the bulk production, so that we get a state-of-art tank, comparable to/better than any futuristic tank of the world. SP's: In the alternate fuel vehicles (AFV) seminars held in the past, the requirement of light tanks for the mountains in the east as well as in the western sector had emerged. Is there any move in this direction? It seems that an Independent Armoured Brigade is being raised for the Eastern theatre with light tanks as reported by the media. DCOAS (P&S): The capability of an Army is an amalgam of equipment and manpower, both of which are processed in parallel for capability enhancement. The numbers required for the capability depends upon dynamics of threat assessment as well as financial prudence. To that end, Indian Army periodically carries out realistic threat assessment and formulates capability required for undertaking its mandated charter. Accordingly, modernisation and force structuring proposals are taken up with the government. As far as the equipment modernisation is concerned, any contemporary Army endeavours to maintain 30 per cent of equipment as state-of-the-art. Accordingly, Indian Army also endeavours to induct new equipment/weapon platforms as per operational requirements, in step with the current trends in the world. Towards that, various new platforms to be inducted in the Army are being considered for various arms and services. SP's: The overhaul of the T-72 tank is behind schedule by a few years. This will adversely affect the fleet of tanks held by the Army. How are we planning to get over this issue? DCOAS (P&S): As you are aware, our T-72 fleet is being overhauled along with the upgrades. Our present overhaul capacity is also being enhanced. All these steps will ensure that the complete mid-life overhaul of the tank, along with the upgrades, is completed in an acceptable time frame which meets our operational requirement. SP's: Long-term strategic planning is the domain of DCOAS (P&S) as well as the VCOAS? Functionally how are the responsibilities shared between the two?? DCOAS (P&S): A well structured and institutionalised planning process is in place for capability development and modernisation of the Indian Army. The VCOAS is responsible for the overall direction, evolution and coordination of these plans. DCOAS (P&S) is responsible for execution and monitoring progress of this process. The responsibilities of the two offices, though separate, are complimentary to each other. SP's: Is the capital budget allotted to the Army adequate considering the voids in the inventory and requirements to modernisation and induction of new technologies? DCOAS (P&S): Though the initial allocations this year are low, there has never been a constraint of capital budget for modernisation and induction of new technologies. Adequate budgetary support has been promised for the new schemes as well as committed liabilities. SP's: The Defence Procurement Procedure (DPP) 2011 was formally released on January 13, 2011. One of the criticisms is that the Ministry of Defence has missed another opportunity to revamp the whole system as the initiatives introduced are of marginal nature and only aim at strengthening the stranglehold of the public sector. What are your views on this issue? DCOAS (P&S): DPP 2011 has evolved as a comprehensive, representative and robust compilation based on the experiences gained while undertaking defence procurements in the past. These have been taken into account while preparing a functional and acceptable DPP in line with ground realities. The DPP has recently been reviewed. An important aspect of the review is the preferred order of categorisation for all capital procurement cases. In this, "Buy Indian" and "Buy & Make (Indian)" will be the preferred categorisation. Procedures for "Buy & Make (Indian)" category have also been simplified. This is likely to give boost to indigenous production and bolster the participation of Indian industry in the defence sector. SP's: How is our offset policy being made more practical? DCOAS (P&S): The revised defence offset guidelines were ratified in July 2012. These guidelines have addressed major policy issues relating to expanding avenues for discharge of offset obligations through transfer of technology (ToT)/transfer of equipment (ToE) as valid means of offset discharge. Further, the Defence Research and Development Organisation (DRDO) has been permitted to acquire a selected list of core technologies as part of offset obligations from foreign vendors. In order to incentivise foreign companies to engage India's micro, small and medium enterprises (MSMEs), the revised guidelines have also, for the first time, allowed multipliers of up to three for technology acquisition by the Defence Research and Development Organisation (DRDO). Extension of banking period to seven years as against earlier period of two years will further facilitate the efficient discharge of offset obligations in the long term. The revised offset guidelines provide a relatively stronger monitoring system by way of creating a Defence Offsets Management Wing (DOMW) to replace the erstwhile Defence Offsets Facilitation Agency (DOFA), with more powers in terms of post contract management. SP's: What is the Army's policy on sensors and surveillance devices and what is their status? In this we may include surveillance satellites, UAVs, LORROS, night vision devices, radars and other ground sensors. How far have we progressed in this direction? DCOAS (P&S): Battlefield surveillance is one of the most important force multipliers. Our surveillance philosophy caters to gap free surveillance from forward to depth areas. The sensors to be procured for strategic to tactical surveillance, have also been identified. These include aerostats, unmanned aerial vehicles (UAVs), battlefield surveillance radars, weapon locating radars, long-range electro-optical sensors, sound ranging systems, etc. Aerostats equipped with surveillance radars and real time communication links have been planned to be inducted. The Heron, a medium-altitude, long-endurance UAV, has been acquired in addition to the Searcher I and II UAVs. Medium-range battlefield surveillance radars (BFSRs) have been introduced into the inventory of Army's surveillance and target acquisition (SATA) units for enhancing the medium-range ground surveillance capability of the Army. The long-range observation system (LORROS) provides day and night surveillance capability. Development of Nishant remotely-piloted vehicle designed by the DRDO, to undertake battlefield surveillance, reconnaissance, real-time engagement of targets by artillery fire-and laser designation has been successfully completed. In addition, we are also going in for enhancing the night fighting capability of our soldiers and combat systems. It can thus be seen that the requirement is being addressed in a holistic manner. SP's: Reconnaissance and Surveillance Troops and Platoons of Armoured Regiments and Mechanised Infantry units respectively, can be excellent assets in war, if equipped appropriately. Is anything being done in this regard? DCOAS (P&S): The Reconnaissance Troops and Platoons of Armoured Regiments and Mechanised Infantry Battalions are force multiplying assets and are the 'eyes and ears' of the Combat Group Commander. While so far they are based on light wheeled vehicles, we are now working towards equipping them with specialised light armoured multipurpose (LAM) vehicle. These vehicles will have adequate firepower and state-of-the-art electronics and optronics. In addition, mini-unmanned aerial vehicles (UAVs) are also planned to be inducted to provide reconnaissance support and extended reach to the Commanders on the field. SP's: What is the growth pattern of the Army Aviation which is a vital element of our offensive and defensive capability? By when will our Cheetah and Chetak helicopters be replaced? DCOAS (P&S): Army Aviation Corps since it's raising, has transformed itself into a full-fledged arm and is poised to further grow exponentially, in tune with the capability development plan of the Army. The inherent knowledge of the Army aviators of ground warfare; and their affinity for troops on ground, makes Army Aviation a battle wining quotient for effect-based operations and tactical battle centric operations. In the medium and long term, Army Aviation will have varied capability of reconnaissance, utility, armed and attack helicopters to respond swiftly and effectively to the Field Force Commander's requirement. As regards the Cheetah and Chetak helicopters; Cheetal and advanced light helicopter (ALH) are being inducted into the armed forces. Replacement helicopter are also being looked at. In addition, there are a large number of developmental projects in the pipeline like the light utility helicopter. SP's: The Army needs dedicated attack helicopters operated by the Army and in direct support of field formations in war. What are implications of the latest government notification in this regards? DCOAS (P&S): The future battlespace will witness complex, swift, short and very violent application of combat resources by the field force commanders who will need to 'look, move and strike deep'. In order to gainfully employ and optimise the tasking of attack helicopters in the tactical battle area, the Ministry of Defence (MoD) has vested the ownership of attack helicopters with the Army. Army Aviation as a manoeuvre arm in third dimension with its enhanced strike capability of attack helicopters will play a very decisive and lethal role; and provide intimate combat support to Battle Groups in the tactical battle area. Induction of these in the Army would be carried out in accordance with the capability development plans of the Indian Army. SP's:	What is the status of the project future infantry soldier as a system (F-INSAS)? It does not seem to have progressed much. DCOAS (P&S): Project F-INSAS perceives the soldier as a system—a situation aware soldier capable of performing multiple roles in battle. His weapon, sight, surveillance system and communication equipment will be an integrated system. It is designed to enhance an individual soldier's capabilities in terms of increasing his lethality while providing him necessary protection at the same time. We have moved from concept stage to execution stage of the project. In the initial phase, priority is being accorded to weapon systems, enhancing night vision, protection and battlefield mobility capabilities. The weapons and equipment are at various stages of procurement process and the project is progressing well. SP's:	What is the progress of our efforts to modernise the Infantry at unit and sub unit level with particular reference to firepower, mobility, surveillance and reconnaissance and night fighting capability? DCOAS (P&S): The future wars are likely to be different from the ones we have fought in the past. Full scale conventional conflicts are likely to recede, giving way to sector specific, short, intense and destructive battles under a nuclear backdrop. In addition, we shall be witnessing a fusion of insurgency and terrorism with the operational environment having a high degree of ambiguity. Hence, it is imperative that we build our capabilities to face the entire spectrum of conflict, from asymmetric to conventional war under a nuclear backdrop. Modernisation of the Infantry is being addressed on priority. State-of-the-art assault rifle and carbine are currently under advanced stages of procurement and shall be instrumental in enhancing firepower and lethality at the soldier level. To cater to the anti-tank defence at Infantry Battalion level, third generation, fire and forget anti-tank guided missiles and rocket launchers are being procured. Enablement of the infantry to enhance the surveillance and effective engagement at night is the key priority area. Short-range battlefield surveillance radar (BFSR) coupled with mini unmanned aerial vehicles (UAVs) would further enhance the surveillance capability of an infantry commander. The initiatives in the field of mobility includes induction of high mobility vehicles, light specialist vehicles and superior troop and load carriage vehicles, lending enhanced mobility in all terrain scenario. The vision of the Infantry is to have a fully-empowered soldier equipped with weapons and equipment which has a decisive technological edge over its adversary.